When you book a day meeting at the Endicott House, you will find the latest technology, conference amenities, world ­class accommodations and an inspiring location in a quaint idyllic setting. Nestled on 25 acres of magnificent landscaped grounds and lush peaceful woods. Our expansive outdoor venue is a favorite of corporate and collegiate groups alike. Meetings are our business, and we believe we know how important it is to open one’s mind to new and exciting ideas. The ambiance of the estate is conducive to creative thinking and endless possibilities. 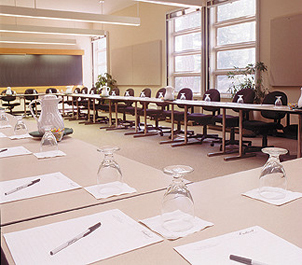 From start to finish, your meeting attendees will feel welcome and will leave having experienced the very finest conference center in New England. Meeting room layouts to suit your needs. Ideal for suburban companies and local colleges.